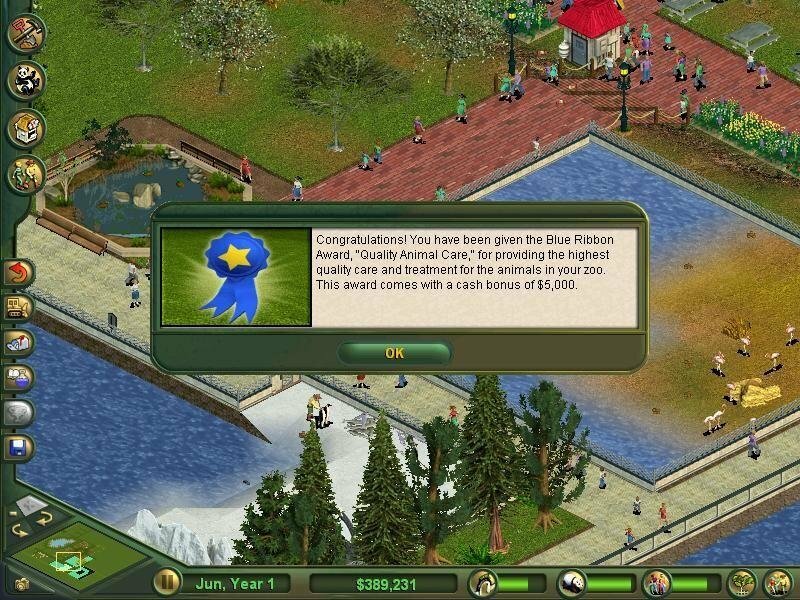 When Roller Coaster Tycoon was released, no one thought a little game made almost entirely by a solitary Scotsman would go on to be one of the best-selling PC games for the next two years. 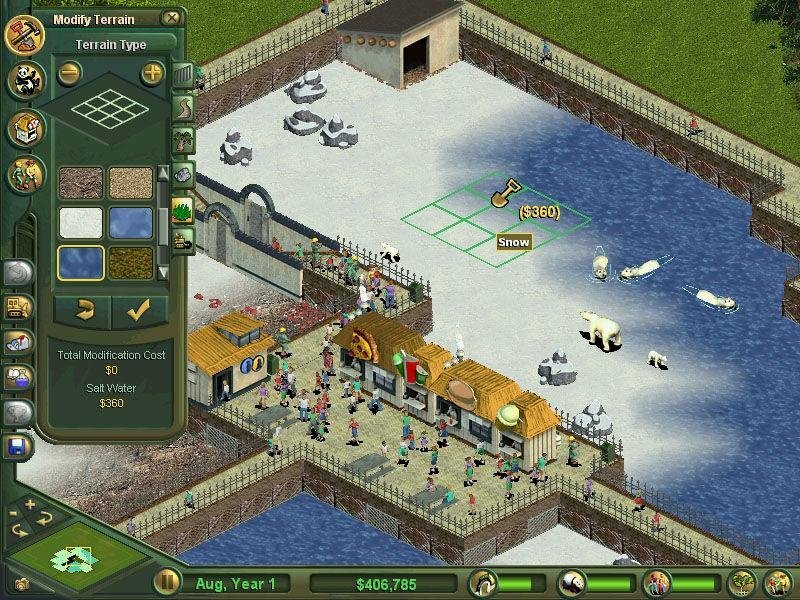 Never one to miss an opportunity to make money, Microsoft went looking for its own tycoon game, and found one from developer Blue Fang. Unfortunately, there’s a lot more to creating a compelling management sim than slapping the word “Tycoon” on it. 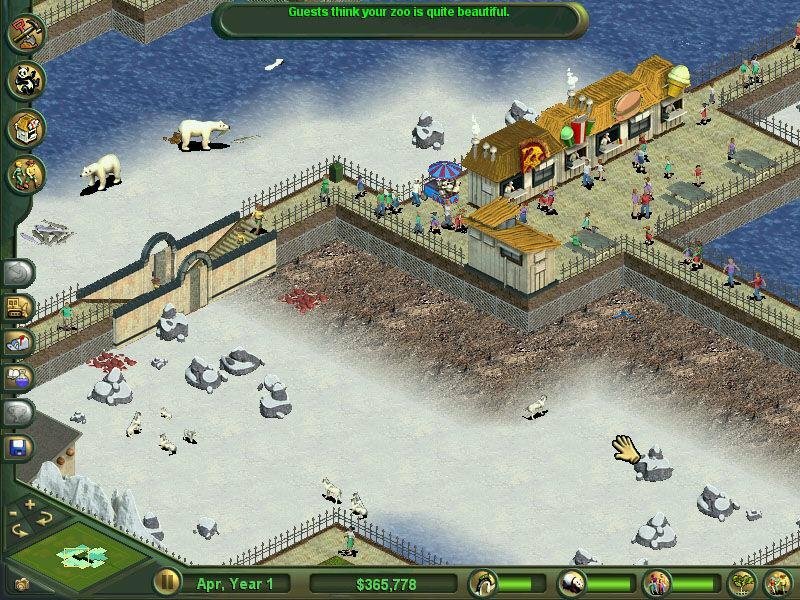 Nothing proves this point more than Zoo Tycoon, a flat and predictable game that’s somewhat amusing. Its Roller Coaster influences are never far from the screen thanks to the familiar interface, little giggling visitors, and pastel color palette. 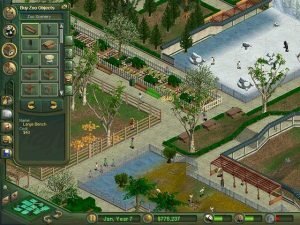 The central problem with Zoo Tycoon, though, is its real dearth of creativity: you can’t display much ingenuity as a player, and the developers have shown little themselves. 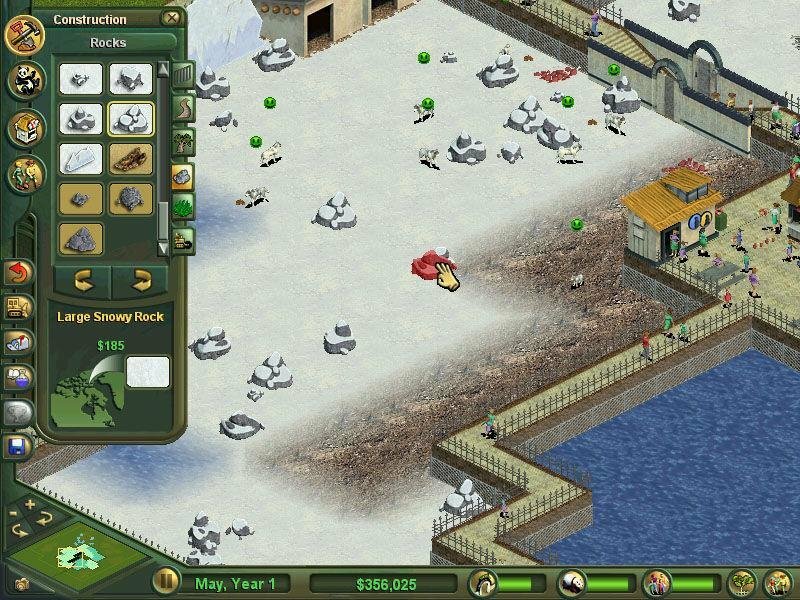 The main task in the game is keeping your animals happy by following the instructions of the zookeepers right down to the literal ground. 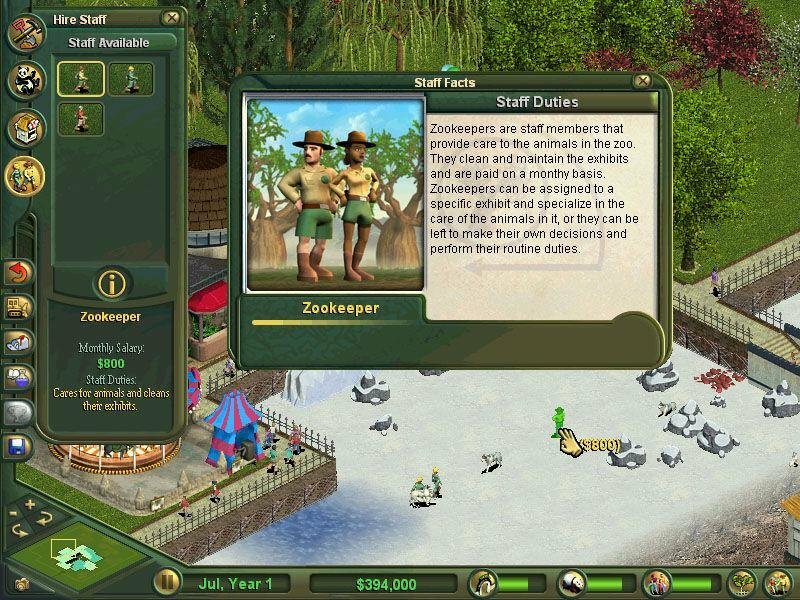 The zookeeper will tell you if the cheetah, for example, needs a little more dirt, a little more water, and a little less grass. As a player, that’s exactly what you do: simply follow instructions. 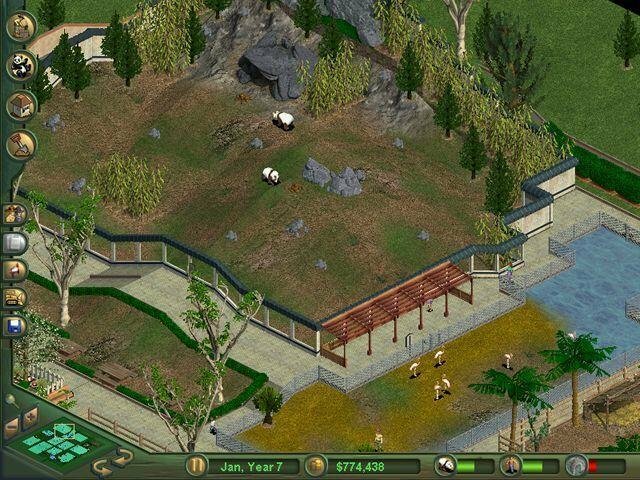 Beyond the individual animal exhibits, the rest of the park is completely pre-fabricated. From the tiny ice-cream stands to the enormous petting zoos, these buildings are already constructed, needing only to be clicked on and placed. You can set the general size of the pens and the layout of the walkways, and tweak the landscape a bit, but for the most part, the game has a cookie-cutter feel. The result of all the pre-fabrication is that almost all your parks look the same, with little opportunity to add any personal touch. Zoo Tycoon has 13 scenarios to complement the standard free-build mode. The tutorials are good, but once you reach the intermediate and advanced scenarios, some cracks appear. 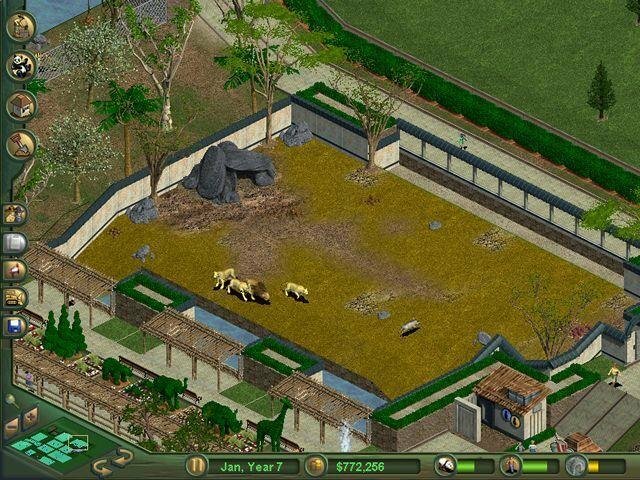 For one, the game strangely allows you to construct your zoo in pause mode. 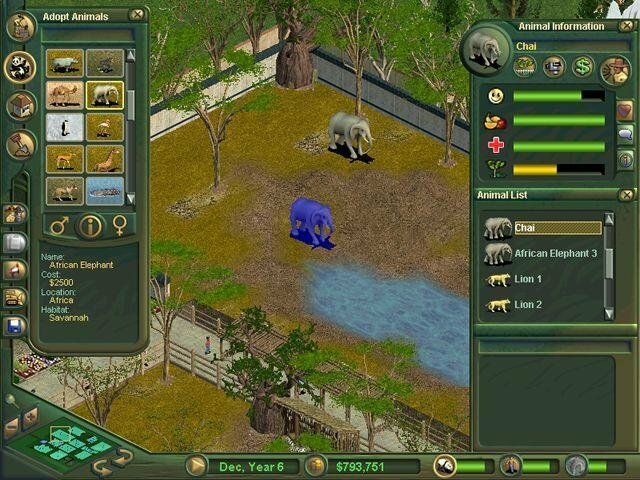 This means that time-sensitive challenges are robbed of their urgency because you can build your zoo exactly the way you want it (cash permitting), and then turn on the clock. 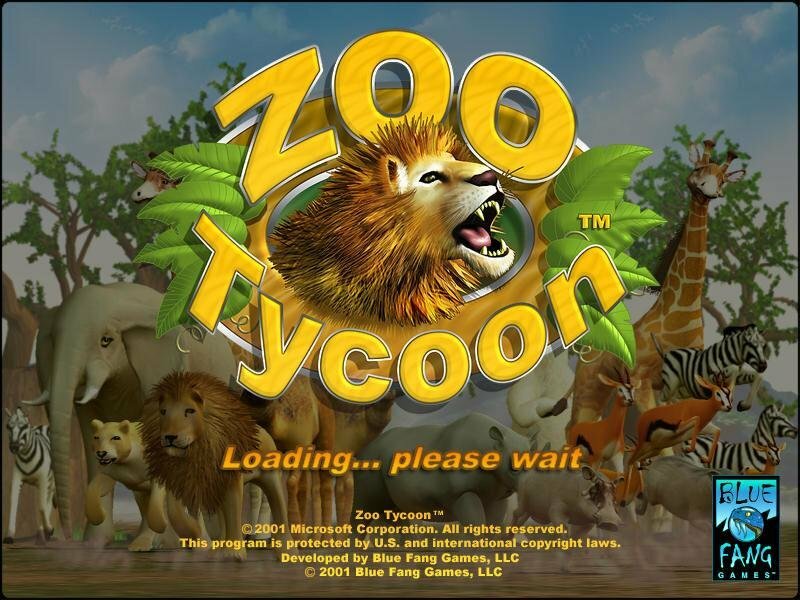 Even worse, you have no way to speed up time, turning Zoo Tycoon into a waiting game if you complete the scenario goals before the time limit. 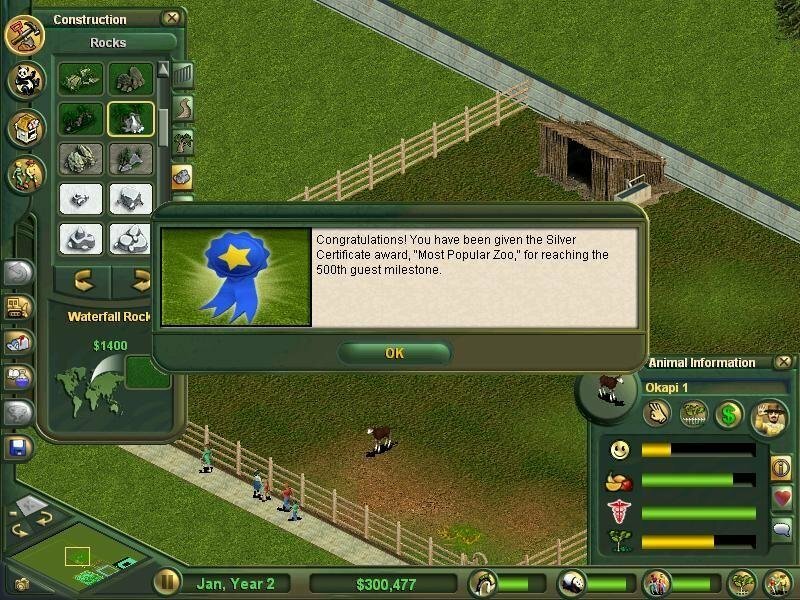 Graphically, Zoo Tycoon is not without its charms. Seeing those cute little people overpay for their salty snacks while gazing at the lions is sorta fun. Everything is quite small, however, so picking up some of the cutesy creatures to examine them is an exercise in pixel hunting. 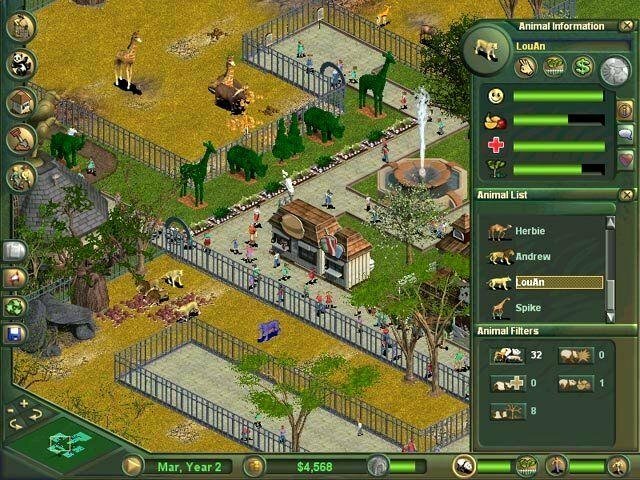 Overall, it’s not a terrible game, but people looking for any sort of substance (like the one that cemented the original Roller Coaster Tycoon as a classic) will be sorely disappointed with the rather mundane if still enjoyable Zoo Tycoon. 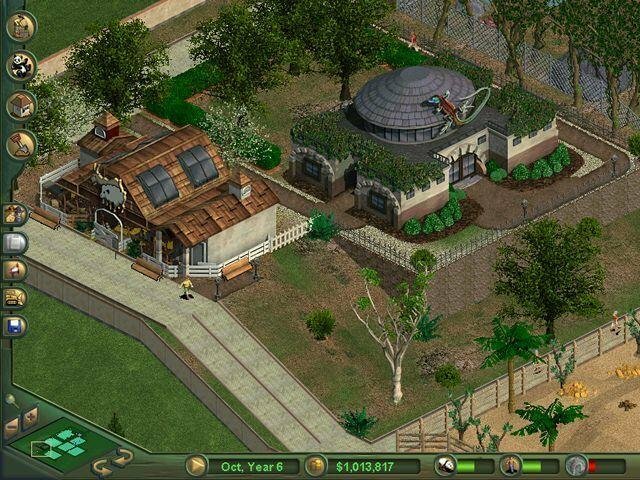 I loved this game and played it a lot. Would like to again. I have the game but haven’t put it in the computer I use now. When I played the game I had Windows 7 now I have Windows 10. I don’t think it would work. Or would it??? We can’t use your PC and test it. Only you can do. 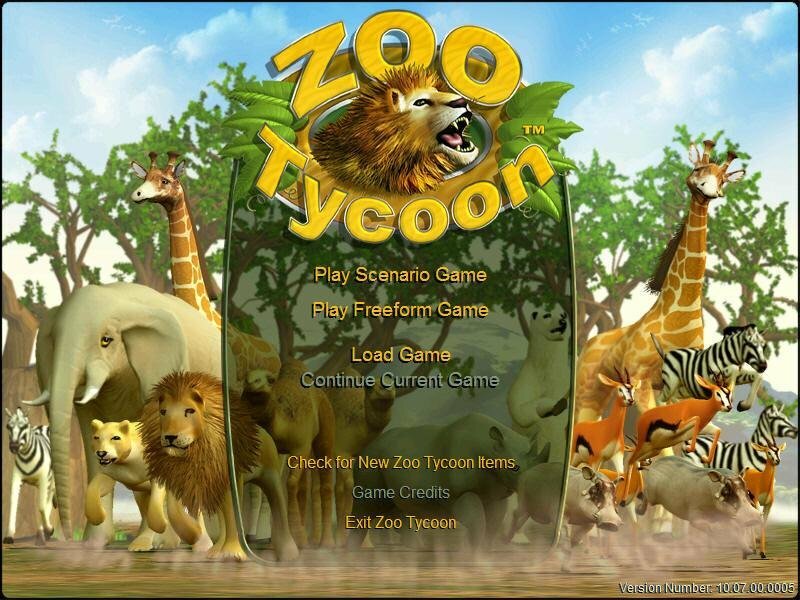 And if it’s too hard for you to THINK, i will tell you to check this website’s homepage, you will find topic about running old games on new systems. Btw, if it gets repaired, is it without virus and ad/malware? 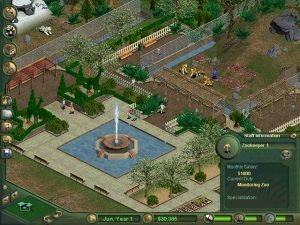 I’m poor and can’t buy a new computer, but I have bought and lost the game a long time ago.